The standard Vineyard Tour & Wine Tasting is £18 per person. The tour takes about 1.5 hours and includes a glass of each of our three English Sparkling Wines per person. 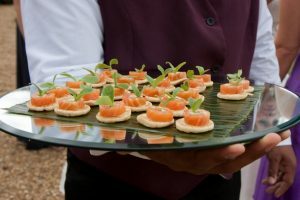 Only with private parties do we offer a selection of delicious canapés to suit each of the wines. 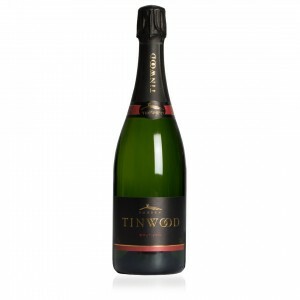 Tinwood Blanc de Blanc served with Salmon, crème fresh & chives canapés. Brut served with baked brie on toasted baguette topped with walnuts and drizzled in honey. Tinwood Rose served with strawberries, chocolates & brownies. 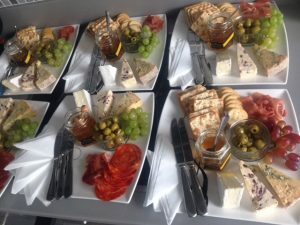 Platters will include a variety of different cheeses accompanied with crackers, olives, grapes and our famous Tinwood honey to drizzle over the cheeses. If you prefer your party/work event/ meeting during the day we also offer a 3 hours time slot between 12:00-15:00 (Monday-Thursday) check for availability what time slots are available with our staff) We can serve a range of luxury baguettes prepared like finger sandwiches. If you just can’t choose and want them both, we will match all canapes and cheeses with all wines. Just sit back and relax and let us handle the food so you can enjoy the bubbles and the company. 6pm Arrival with a welcome glass of Tinwood Blanc de Blancs on arrival, our staff will be walking around with canapes and more wine. 6.30pm A short explanation about Tinwood; the history of the farm and the family Estate, a short vineyard tour for your guests (only if wanted). We can make this as long or as short as you wish. 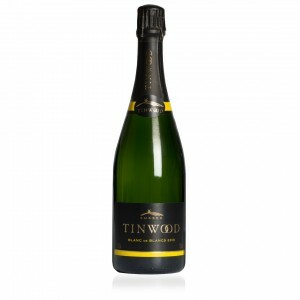 7pm We pour the Tinwood Brut, all tables will be served cheese platters and we will give an explanation about the wine and food pairing. 7:15pm Pouring of the Rose with matching chocolates/brownies with strawberries etc. 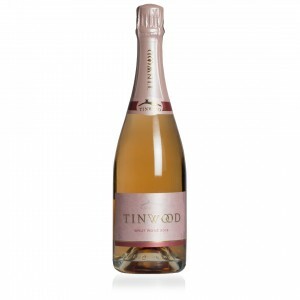 7:30pm Finish the Tinwood Tasting, letting your guests vote for the favorite of the evening. 7:30pm-9pm Guests will have 1.5 hours free time to order extra drinks and turn the music up for some dancing. 9pm Taxi’s to pick up your guests to go into town? Or maybe a short walk next door to the pub that is serving drinks till 23:30pm (5 min walk through the vines) or pay £ 150 room hire to stay between 21:00-23:00 at Tinwood Estate for more drinks. This includes: private hire, with staff members walking around serving during the event, cleaning cost for the next morning are included, the tables will be laid before arrival. Available: Red & white wines at £ 29 a bottle. Corkage if you want to bring your own wine £20 a bottle. Beers: £3 a bottle. Maximum of 50/60 people inside (100 outside) after May 2019, as we are building a new tasting room. Private parties have the venue for 3 hours, any addition hours later can be book with an extra hourly fee to cover staff and cleaning cost. We allow decorations, flowers and balloons etc to be supplied (if you drop them in to us in the morning we can decorate the venue for you). You can organise a chef with a sit down menu, we charge a £15 a head venue hire this includes 1 welcome glass of Tinwood bubbly (chefs ask for a minimum of 20 people) you can also organise a hog roast or BBQ caterer, find below some photo and menu examples of previous parties. With private parties we can offer an selection of still white & red wines, beers, cocktails and tea’s and coffees. We charge a corkage fee if guests want to bring there own wines. To book out an evening/secure a date we charge a deposit on booking. The final invoice can then be paid 30 days prior to arrival. If you are looking to host a private party at our venue near Chichester, our event planning team would love to help you achieve your aims. Please get in touch to discuss your plans.